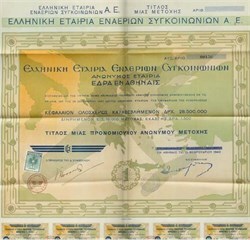 Beautiful large certificate from Greek Airlines issued in 1940. This historic document has an ornate border around it with an image of an an airplane flying over Europe. This item has the signatures of the Company's officers and is over 60 years old. This is the fist time we have seen a certificate from this company and belive it to be quite scarce. Given that this was issued at the beginning of WWII, the tourist business was not very robust and the company folded.